As part of my class for my negotiation module yesterday, the students played ‘Slugs and Worms’, a game that asks them to agree on levels of funding for research into these two fine members of the animal kingdom. The game stemmed from a desire to explore the impact of voting weights on negotiation dynamics, as part of a session on power. But it’s also fair to say that this game, more than any other I’ve written, has produced numerous unintended consequences. In its original version, students only got told to agree values for ‘Issue A’ and ‘Issue B’, the values being the same as the money amounts (i.e. what’s now £10m was 10). the upshot was that I spent most of the time in the gameplay trying to explain how it worked and what they had to do (essentially, find a pay-off between the two issues). Once that was done, we could get along, but it wasn’t very elegant. Indeed, those first iterations also showed that what I now consider to be the main revelation of the game was something that I’d included by accident. As a way of differentiating players, I’d given each one a name and a country. In gameplay began by sitting in national groups, before reconfiguring into groups with shared values, a process that closely mimics the formation of transnational groups in the European Parliament and which – more generically – highlights the importance of multiple identities. Thus, I came to foreground this later point in my feedback, but the confusion still remained. After last year’s run, I rewrote the game to its current form. On one hand, it was a success: everyone understood quickly and easily what they had to do and the whole time was spent negotiating, with the EP-style reconfiguration happening as before. On the other, the gameplay was totally different, simply because of the use of monetary values. In the original version, the level of abstraction was such that there was no BATNA (Best Alternative to a Negotiated Agreement): non-agreement benefited no-one. In the new version, I had unwittingly introduced such a possibility, since any failure to agree would produce a result that met the interests of several players (i.e. the ones with values of £0m for both slugs and worms). 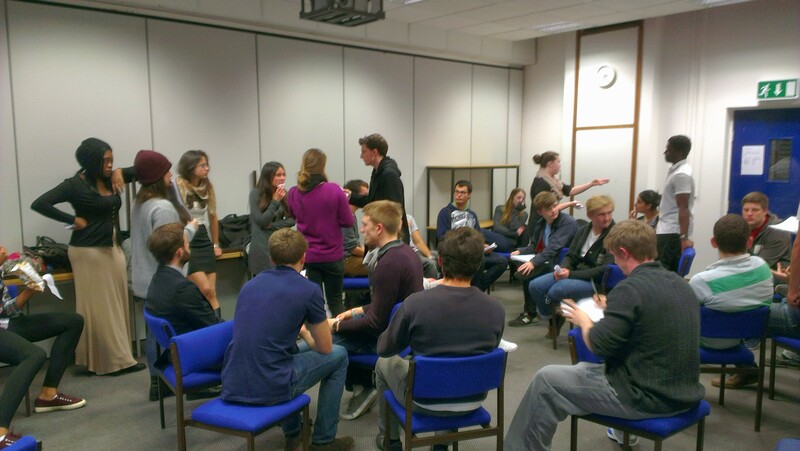 Those students quickly appreciated this and played the room very well, building a blocking coalition and then being indeterminate in their willingness to be flexible, in turn producing more discussion and – ultimately – non-agreement. In the context of a session on power, the validity of pursuing the BATNA is a very valid point and one that’s worthy of discussion, but it wasn’t what I’d expected to be discussing. This all prompts two observations. Firstly, and simply, students often notice things that pass academic staff by. Secondly, and almost as simply, simulations present a seemingly simple face, but mask much complexity. On two occasions now, it has only been in the playing that the reality of this simulation has been exposed. Until you play, you don’t really know how it’ll work and that’s a useful lesson for all of us to remember.